The Life Size project is under way. 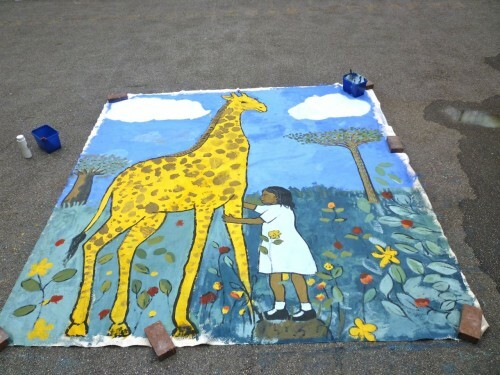 About 100 children from Drayton Park School and myself painted a three metre tall giraffe in one school day. It was tight and I wish there had been more time, but it went smoothly. Life Size is all about showing children size and scale in real terms. We talked about African animals, ways of measuring, what giraffes are like in the wild and they seemed genuinely interested. I got a great big box of chocolates and a thank you card from just about everyone so it was well worth it. The next workshops are at the end of July throughout Brent Council Libraries. I’ll try to remember to give a better heads up to those interested in coming along if you’re in London. For more about Life Size, visit my website and look up the events & appearances pages.